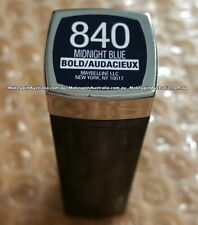 NEW Full Size Maybelline Bolds Color Sensational Bolds 840 Midnight Blue. Manufacturer Maybelline. UPC or Ean 041554550993. Maybelline Colorsensational The Loaded Bolds Lipstick, You Choose! 5 out of 5 stars - Maybelline Colorsensational The Loaded Bolds Lipstick, You Choose! 1 product rating1 product ratings - Maybelline Colorsensational The Loaded Bolds Lipstick, You Choose! IMPERFECT TIP (SEE PHOTO) . Color: 840 Midnight Blue. Maybelline Lip Studio Python Metallic Lip Kit, 0.09 oz. 840 Midnight Blue (Loaded Bolds) . You and your makeup is our main priority. to allow us the opportunity to assist you;. Vibrant color. Creamy matte. Ultra hydrating. ALL ARE #15 VENOMOUS. NEW / SEALED. Beyond bold, it’s sensational. Maybelline’s creamy lip color is available in a collection of full-spectrum shades from jet black to bright white. Sumptuous honey nectar leaves a creamy finish. Dermatologist tested. It's lip artistry made easy! Make an impact in chromatic lip color with a python effect. [ /- May Contain/Peut Contenir: Mica, CI 77491, CI 77492, CI 77499/Iron Oxides, CI 77891/Titanium Dioxide, CI 77742/Manganese Violet, CI 15850/Red 7 Lake, CI 77120/Barium Sulfate]. Maybelline Python Metallic Lip Kit #30 PROVOKED. Make an impact in chromatic color with a python effect. Create custom lip looks in a flash. It's lip artistry made easy! Apply lip shadow with finger on top of colored base, and layer as desired to create your own look. Maybelline Color Sensational Vivid Hot Lacquer Liquid Lipstick Brand new line's high-impact gloss goes vivid! Strong lacquered shine and opaque color melt onto the lips for your most impactful lip look. Step 1. Apply lip lacquer with the applicator wand in the center of your upper lip and follow the contours of your mouth. Step 2. Glide the lip lacquer across the entire bottom lip. Product Form: Liquid Beauty Purpose: Shine enhancing. Receive 1. All new, full size but not sealed. Untouched in full working condition. 840 MIDNIGHT BLUE. LOT # MFGRS APP EXP 2021. ITEM AS DESCRIBED. Create custom lip looks in a flash. Mrs L Mistry. Shade 750 Wickedly White & 840 Midnight Blue. MAYBELLINE EYESTUDIO 600 STRIKING BLUE. Accentuate your facial features with the 600 STRIKING BLUE fromMaybelline. 600 STRIKING BLUE. Sweep onto targeted areas, such as cheekbones, brow bones, and down the bridge of the nose. You will receive what is pictured. Product is flawed, but they are not used. They have swipes and knicks. MAYBELLINE PYTHON Metallic Lip Kit 2.7g 15 Venomous - NEW Sealed. Condition is New. Dispatched with Royal Mail 2nd Class. IngredientsG948395 INGREDIENTS: ISONONYL ISONONANOATE ?. OCTYLDODECANOL ?. OLEYL ERUCATE ?. CERA ALBA / BEESWAX ?. SYNTHETIC WAX ?. PARAFFIN ?. CERA MICROCRISTALLINA / MICROCRYSTALLINE WAX ?. DISTEARDIMONIUM HECTORITE ?.